How Can CROs Boost Their Effectiveness? - Macleod & Co.
Clinical Research Organizations (CROs) are among the most challenging businesses to market. 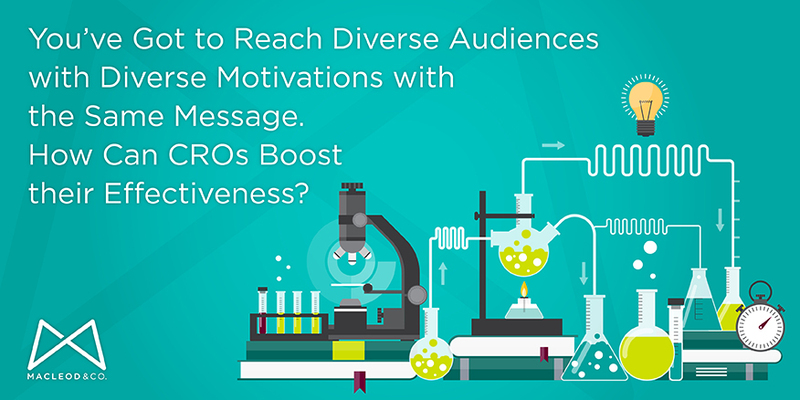 They must appeal to intellectually diverse audiences with equally diverse motivations — from sponsors to regulators to volunteers to special populations. This is further complicated by the plethora of downright imaginative misinformation sources and a rigid regulation structure. As we play our part in furthering scientific breakthrough and increasing quality of life, the hurdles can really make a dent in your mojo. We’ve seen a lot of attempts to address this in our work with CROs, and solutions often feel incomplete. To achieve their desired outcome, marketers need to analyze, optimize and align. A process of Holistic Marketing can root out issues and, oftentimes, turn them into opportunities. To address the specific challenge of appealing to diverse range of groups, brand analysis is a critical starting point. When read “from a distance,” what is the likely impression of each of your constituent groups? Does it represent the experience that a sponsor will have? A volunteer? It’s important to evaluate these as objectively as possible and resist the urge to go with a kitchen-table focus group. Unless you’ve got a few execs from Pfizer over for dinner. Does your brand evoke your organizational strengths? Does your brand call to mind your Unique Selling Proposition (USP) for volunteers? Most importantly, does your brand resonate with your organizational culture? A powerful brand will do all of these things. ALL of them. It’s common that leaders of CROs (or any business) haven’t actually considered their organizational strengths, or the USP, or organizational culture… Who cares about that? Well, your customers do. Your volunteers do. And once you start paying attention and see the benefits of a managed culture, you will, too. A weak brand, on the other hand, will create dissonance with your target audience. No one engages with dissonance. A bright, happy brand and a rude receptionist? You’ve ruined your credibility. A super-scientific brand and hand-written notes on a faxed report? Your data is called into question. It may not be conscious, but it happens. Know what your organization is good at, engage your staff and customers on it, and talk about it often and in lots of different ways. It lends credibility to all of your efforts. One CRO we worked with had a USP they didn’t know about – an uncanny organizational ability to listen. By talking with customers, we learned that the client’s ability to listen kept sponsors coming back, but their sponsor communications did nothing to espouse it. A rebrand and a new name helped sponsors who hadn’t worked with the company yet see this advantage. Additionally, those who were already converted felt better about recommending the company to colleagues. The successful solution would never have been uncovered if we hadn’t talked to our client’s customers. And when we talked to the staff about what their customers were saying about them, they were all very proud of their reputations. Everyone wins. Interested in a free brand report card for your CRO? We’d be happy to give you our honest assessment. Call us at 612.315.5200 or email us at hello@macleodandco.com and let us know. We’d love to help!